The DT series (Dumper Track) will be available in three models with various skip options making them ideal material handling solutions for smaller jobs that need the advantages of a tracked machine. Wacker Neuson is expanding its product offering to include a new line of mini track dumpers, which will be available in the spring of 2019. The DT series (Dumper Track) will be available in three models with various skip options making them ideal material handling solutions for smaller jobs that need the advantages of a tracked machine. They are designed for smooth travel while maneuvering across rough terrain and in confined areas. DT08: 1,763 lbs. (.8 ton) payload, 9.1 hp Honda gasoline engine, front tip skip with heaped capacity of 13.7 cu. ft.
DT10: 2,205 lbs. (1.0 ton) payload, 13.9 hp Kubota diesel engine, swivel tip skip with heaped capacity of 16.2 cu. ft.
DT10: 2,205 lbs. (1.0 ton) payload, 13.9 hp Kubota diesel engine, front tip skip with self-loading shovel and heaped capacity of 15.8 cu. ft.
DT10: 2,205 lbs. (1.0 ton) payload, 13.9 hp Kubota diesel engine, front tip skip platform for versatile material transport. DT15: 3,308 lbs. (1.5 ton) payload, 23 hp Kubota diesel engine, swivel tip skip with heaped capacity of 26.8 cu. ft.
DT15: 3,308 lbs. (1.5 ton) payload, 23 hp Kubota diesel engine, 3-way side tipping skip platform with tailgate style sides. The DT15 model includes a seated operator's platform with a rollover protection structure that is foldable for low passageways. The various skip configurations allow for the easy transportation and precise placement of materials while the self-loading shovel delivers additional labor saving loading capabilities, as well as easy unloading of material. 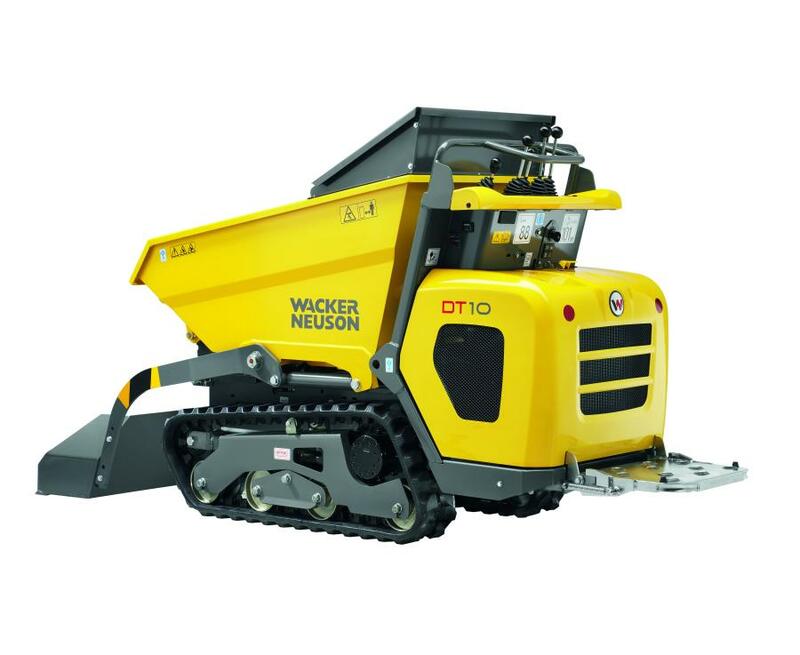 Wacker Neuson's high-end track dumpers offer a new class of models in the market. The machines are designed for high performance and lower cost of ownership. The DT series is manufactured with high quality components and offers a fully hydrostatic drive. The hydrostatic drive train plays a key role in providing easy and comfortable operation with no gears to change during operation. The machines have a low maintenance, long life design with fewer wear parts. All models feature rubber tracks with optimal weight distribution to reduce ground pressure and prevent damage on sensitive surfaces, as well as providing added stability. The suspension-mounted rollers (DT10 and DT15) compensate for uneven ground and deliver a smoother ride on rough terrain and over curbs or steps. Wacker Neuson's new mini track dumpers are an excellent addition to any rental or contractor fleet, according to the manufacturer. The compact dimensions are ideal for traveling through narrow passages and the easy operation make them ideal for landscape, construction, cemetery, golf course, parks and trail maintenance, nursery and farm applications. For more information, visit www.wackerneuson.com.